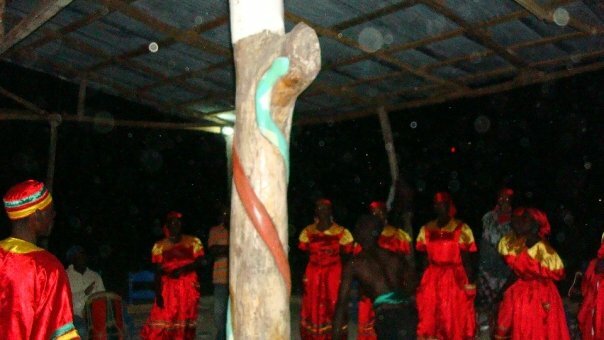 I traveled to Haiti, about 8 years ago now, to learn a few things about Vodou, since I had been dabbling on my own for far too many years previously (23 all together rofl) :D. Here are some of my experiences while there. Here is where I will be adding photos from my recent trip to Togo, West Africa, as well as some from my trip to Haiti a decade back. For products and services please scroll down. Here's my Haiti blog post from years back. The plane rides over weren't too bad. We stayed at a nice hotel overnight in Fort Lauderdale. Nice since all of the cheap ones were completely sold out. Superbowl or something that weekend. It was far more comfortable then sleeping in the airport at least. Fort Lauderdale looked like the most boring city I have ever seen. I'm not so sure why anyone would want to vacation there? When we got off the plane in Port Au Prince Haiti the first thing we say were a bunch of guys in bright yellow Western Union logo t-shirts playing Djembe drums and bangos to welcome us. I can see with the rates they charge that they can afford to hire a group of musicians to play whenever an international flight comes in. All of our luggage arrived with our flight, even though we had late checkin in Seattle due to us arriving at the airport at the very last minute. We were wondering which questions customs might ask us since it is recommended that no one do any none essential to travel to Haiti currently. Apparently customs didn't feel they needed to ask us any questions, well that or they couldn't speak English. It was difficult to tell which was the case. They also didn't feel it necessary to check our bags. Unfortunately I don't think this will be the case leaving the country. It only took half an hour to get our luggage and out of the airport. Our friends were waiting right outside the airport for us with a large sign. M hadn't been to a third world country before so he fell for the guy who grabbed the baggage cart and wheeled it around for us. He then demanded money, I gave him $2, and he asked for $10. I laughed and told him to go away. He persisted and I asked him to go away a little more rudely and louder. He finally left. Our friend's apartment was quite nice. It was about the same as any apartment in North America accept that it had very nice stone tile floors and no running water. The running water problem was gotten around with giant buckets of water and smaller buckets to poor the water. Everyone was so friendly and welcoming, they were a joy to be around. We met the entire extended family and friends! The lady's son was the cutest who would run up and jump onto us with a giant hug everytime we saw him. We went with our hostess out to the local grocery store to pick up some food. The best way to get around in Haiti is to take a tap tap, which is a sort of open truck where you cram a bunch of people into the back onto seats. Most of them are comfortable enough, but you get the odd one where you are hoping the ride will end soon. Bus fare cost an entire 2.5 cents each. I paid for the groceries and was surprised that they came out to about $5. I think I should move here lol. Unlike Egypt and Mexico Haiti apparently doesn't have a separate much more expensive price for foreigners then it does for the locals... or so I hear. I will find out for sure when I head out on my own. We then went over to the market which had fresh everything. The peas we bought were even being taken out of the pods as we watched. Now that is fresh. They were definitely better then that frozen crap we are used to. I also bought a bag of 21 habineros and some cassava bread while I was out. The people we were staying with cooked us an extremely delicious lunch, which consisted of beans, peas, tomatoes, rice and many good spices. Fortunately it wasn't too spicy, but just enough to taste good. Afterwards we just passed out on the couches as we were so tired due to lack of sleep during travel and the hot Haiti sun. I don't think Haitians eat dinner. Fortunately the lunches are quite large. During my nap I kept hearing loud music and just had to go check it out. So at about 10pm at night we left the house to go see the music/band playing. It was after dark, and we were warned to never leave the house after dark, but we were going with a local and there was music involved. We walked for about 10 blocks looking at all the street vendors who were selling about everything under the sun with oil lamps to light things. There was the odd streetlight, but not many. We also took a tap tap to shorten the trip. The event was basically one of the mini festivals leading up to carnival which happens at the end of this month. They have them every Sunday. There were hundreds of people down at the square all crowded around dancing and enjoying themselves. We also stopped for some of the BEST icecream ever! We were fortunate enough to sleep on a comfy pullout couch that evening, and somehow managed to sleep in a few hours past when everyone was awake and walking around us. Usually I wake up if a person even walks by, but this morning I managed to sleep through everyone talking loudly and hanging out in the same room. I did manage to have a "shower" in the morning with some assistance from M and a bucket. Heated water really is a luxury that those in first world countries enjoy. They made us breakfast in the morning, extremely good omelets. I wonder if any of the eggs used were from the many chickens which wander around the neighborhood but seem to live across the street in the grounds of an apartment building. M was keeping count how many times per day the rooster would chase down a hen to have some fun. Apparently he was an extremely busy rooster. The maid came in to make the breakfast for everyone and to clean up the place. I guess when you only have to pay the maid $5-$10 per day it's not too bad. Our main outing of the day was to the giant cemetery in Port Au Prince. It was really quite large. As soon as the taxi pulled up I could feel VERY strong. Strong enough that I had to shut down quickly lest I be overwhelmed. We went up to the front gate and were told no photos whatsoever.... then once we got in the "inspector" approached us and offered us a tour of the graveyard. I asked how much it would cost lol. I was hoping to ditch him actually, but he proved useful as soon he told me photo taking was included in the price. There was a main crossing of roads, but not technically a crossroad where people were doing rum offerings with some fire and some other stuff. We walked along for a bit and he pointed out various famous graves including Baby Doc's. He then asked me if I would like to see the grave of the first man buried here.... HELL YEAH! Was my answer. Now I suddenly didn't mind our self appointed graveyard guide. He brought us past a little stand that was selling bottles of rum, 7 day novena candles, plantain, necklaces, and some other stuff. Right around the corner from the stand was the Baron grave, with streamers people would light on fire, much much rum, food and so many other offerings. I got to see a person do a full proper offering to Baron; unfortunately it was all in Creole and I couldn't tell a word he was saying. I was a little shy with all of the Haitians around and our friend definitely not being Vodou, so I just quickly walked in, placed my offering and said a quick something to Baron. Next up it was Mmn Brigettes grave. I left coins, which made the locals laugh quite a bit. I definitely wasn't prepared or I would have had much rum, food and etc. with me. I did feel her presence though, and she didn't seem to disapproved of the unprepared whitey. We picked up our friend's son from school then walked home. We were going to do a tour of the Barboncourt rum distillery, but unfortunately you have to book your tour at least a day in advance, so we didn't get to go. We were leaving for The city we were staying in the next day, so we will just have to wait until the way back for the rum tour. Apparently they have many many different rum flavours including coffee, chocolate, fruit flavoured and etc. I am definitely after some of their 5 star rum that is aged 15 years, as it is a very popular offering for a couple of different folks. Well actually I doubt any invisible would really mind some 5 star Barbancourt rum! When we returned, and after a bit of a couch nap we were served some extremely yummy flavoured rice and pork (I think). The food is definitely awesome in Haiti. Also some fresh squeezed grapefruit juice that was actually really sweet. It was some of the best fresh squeezed juice I have had. Of course even the canned mango and other juices here are oh so good. I can't wait to find the local fresh squeezed juice stands around here! Where we are staying they have a balcony at the apartment and we are on the 3rd floor and the views of the city and ocean are just amazing. The cool breezes that high up and outside aren't bad either. That night we were invited out to the bar with our friends. It was only a Monday night, so not everyone came out unfortunately. It also wasn't very busy at the bar, only a few people there aside from us. They apparently had the best tasting beer ever. I'm allergic to beer so I wouldn't know but I heard it was good. I had an amaretto instead and it was quite tasty. M and I also ordered some food. I couldn't remember which creole word meant which sort of meat, so I took a chance and apparently ended up ordering gizzards. They were quite good! The music at the bar was just great, but we didn't do any dancing anyways. I was definitely still worn out from the ordeal it took to get M and I to Haiti, so wasn't much up for dancing anyways. We didn't stay that late since we had to get up at 4:30am to catch our bus out of town. Waking up at 4am was difficult however the rooster across the street helped quite a bit with that. We were contemplating how good rooster might taste for breakfast. Fortunately we had a ride over to the "bus station", since figuring out tap taps at 5am definitely wasn't on my really want to do list. The "bus station" was just a huge pile of "buses" all cluttered around one general area. Once a bus gets too full to cram yet another person in, they leave for their destination. The "bus" we took was a passenger van, and as M pointed out was 8 people past it's capacity. Fitting both of us and our backpacks into the very back seat of the bus was more then difficult! So we were driving along, all smushed in amongst many Haitians, going along the beautiful mountain highway when the bus stopped, pulled over and we were all told to get out. For a moment I thought perhaps someone was thinking of robbing a busload of people (too many stories about the dangers of Haiti) since we saw the bus driver hand over a large sum of money to someone. I did notice however that the people who stopped the bus were smiling so I knew all was well. We all stood around for about a minute then proceeded up the hill through the bushes to get up around the corner of the highway. There was a semi-trailer which had jackknifed along the highway and no one could get through at all. The military were there and yelling at us to stay where we were and not go up the hill. Well we sure the hell weren't going to stay where our bus had now taken on a whole new set of passengers... I figured going the other way, so logic would only state there was a bus waiting for us up ahead to do the same thing. We did wonder for a time if there would be transportation on the other side or we would all be hitchhiking. This "bus" was even more packed, and had even harder seats. Well we finally made it to The city we were staying in, or that would be past The city we were staying in. It was such a rural looking road that I didn't think we had made it yet, but apparently we had. We were met with a throng of Haitians on motorcycles all offering to take us to where we needed to go for a fee. We asked the price and it was good, so off we went, M on the back of one motorcycle with most of the luggage, and myself on the other. It was definitely good he ditched his suitcase in favour of a backpack in Port Au Prince. Suitcases just aren't very useful for travel in third world countries. We had selected two motorcycle taxis where the drivers had heard of our hotel, so we made it there just fine. Even better news was that yes there were still rooms at the hotel! We were told by our friends in Port Au Prince that all the rooms were booked up in The city we were staying in since Carnival was next week. However either no one knows about the hotel we stayed at, or our friends were hoping to get us to stay with their friend who could make a little money. We did want to stay at this one particular hotel though since it was right next to the people we were going to meet in Haiti. We were extremely happy with the room, it was nice, clean, had a fridge and best of all RUNNING WATER! There is nothing like having actual running water in such a hot country. There was even a ceiling fan. You really do take running water for granted, right up until you have to spend a few days washing up and showering using the cold water bucket system. Now the hotel didn't really have hot water, but it wasn't all that cold, and we were hot from the travels so it worked out quite well. It was also really nice to be able to flush the toilet instead of just fill it full of water to have the stuff go down. You definitely re-define luxury around here. So we headed out down the road to find some bottled water. This was more difficult then one may imagine. Haitians who don't have much money really have no interest in paying for water, which they get in large buckets for a very low cost. This also isn't a tourist area, so they wouldn't have any reason to sell bottled water. However you could get many different types of pop as well as Red Bull energy drinks. I did finally find some water, and bought them out, the entire two bottles they had. I also bought some deep fried something or another to enjoy for lunch. It was quite good, but definitely not along the lines of diet food. We soon realized that the idea of a bank machine where you can put a card into and take out cash was a foreign concept. Most of the banks were little wood huts. We were fortunately told that there were a couple of banks downtown which do visa advances. So we took the motorcycle taxis into town and partook on "adventure get $2000". So you would think if you have four bank cards and a couple of credit cards between you, you could easily get $2000 anywhere you want right? No. So we waited in line at one bank for an hour, with the odd person seemingly placed in line before us. Apparently we were even pushed ahead a bit by D demanding we be served soon. The people were called by letter instead of number like usual, so D was accusing the bank lady of not knowing her alphabet lol. Well we didn't get the hoped for $2000, but we did at least get the daily maximum of $500. We knew we should have paid for our room with the credit card instead of cash. Due to incontinences along the way to Haiti (like a really bad car accident and having to wait for a tow truck for 3 hours (R didn't like my idea of just leaving the totalled car there on the side of the highway and catching a cab lol), we hadn't had time to get any cash to go to Haiti with. Fortunately I had brought $800 US cash, which goes a very long way in Haiti. Actually that much would have covered the entire 11 days for both of us, but we also wanted to pay for a little Vodou teaching, so we needed to get some extra cash. Well we decided the whole $500 per day at the bank with long lineups process was far too painful, so we got ahold of someone to Western Union us the money we needed. Those damn yellow shirted drummers back at the airport must have done some Vodou on us! While I was waiting for W to try to get money from the bank I ventured out again in search of water. There was only one "store" which sold drinks, and even looking all through his fridge (not plugged in) I couldn't find a single bottle of water. I took out a Red bull and handed the many a 250 guard bill. Well like I said Haitians don't have a lot of money, so changing a large bill is difficult. So I bought 4 bottles of red bull and at this point he was able to make change. We then returned to the hotel via the motorcycles again and had an extremely delicious dinner. It was only $12 for dinner for both of us, more then we could even finish. I had fish, and M had a nice large chunk of beef. This included orange juice, bread and etc. Yep that's it, I think I'm moving to Haiti! Ahead of time I had contacted the folks I knew to have a little Vodou work done for me while in Haiti... so we met D during the day. After about 2 minutes of D's broken French, and R's broken French, D quickly headed off to find a translator. He returned about 5 minutes later with someone who is a local French teacher, who also spoke very good English. So this person translated back and forth for us, which was extremely nice. Unfortunately he definitely didn't feel or seem to do Vodou so it was a little odd. Later I found out that he was Protestant and definitely didn't do Vodou. Later in the evening D came back with a much better translator who felt like he did a little Vodou, so I was far more comfortable around him. He also knew English a LOT better. I asked if he did Vodou, and he said of course, he's Hatian. D spent a few hours with M and I telling us the most amazing things. I definitely have to say he knows what he is talking about, and has a very good connection with the Lwa. D had offered us a week-long seminar about Vodou, and we just couldn't resist. Also when we first met him, you can definitely tell he does Vodou, and is quite experienced at it. What is quite amazing to me was that most Hatians didn't feel that strongly associated with Vodou. S o either they were really good at hiding things, or not a large percentage of the population practice it all that seriously. After D and his friend left M and I watched Serpent and the Rainbow as he had never seen the movie (!!) before. One thing that I have noticed about the Vodou in Haiti as opposed to the Vodou/Voodoo in the US, and other magics, is that the Vodou here definitely feels more physical and there is a much stronger spiritual aspect to it. You can feel the spiritual aspect so much more here in Haiti. 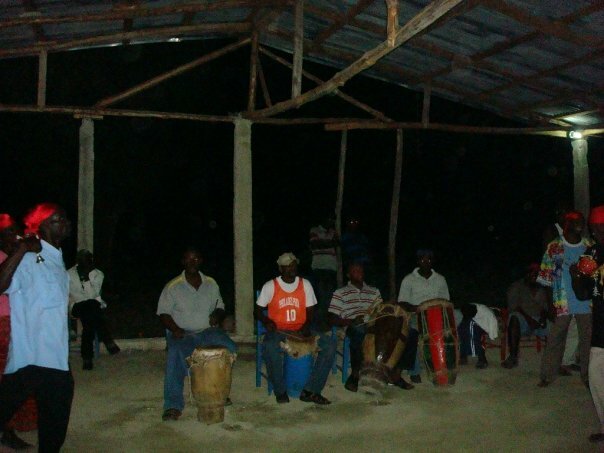 It is as if the entire country is filled with it, and everyone who does a little Vodou does it full heartedly. The energy in the graveyard and at the hotel next to the Peristyle definitely had an abundance of this energy, and of various spirits. I have also noticed a lot more invisibles here that I can see, translucently. I would say most of them have been friendly so far. Of course the guardian ones I keep with me probably keep the nasty ones out, however I seem to run into a lot more unfriendly spirits in North America for some reason. Apparently there are less malcontent spirits here, or I just haven't been here long enough to be noticed by them yet. After seeing 1/3rd the price airfare to Haiti my friend and I decided we had to make the trip. I have always wanted to go, but never have for whatever reason. On this forum we had heard that it isn't the best time to go, but thought we should anyways. Now we were nearly deterred since we got into a bad car accident on the way to the airport. However we could still walk, so I still wanted to go LOL. In case it was supposed to be an omen, I just asked the spirits if we really aren't meant to go, just make us miss the plane. Well somehow we still made our flight even though we had to wait 3 damn hours for a towtruck. Then it was off across the country on a "bus". I don't make all that much money, so it was definitely budget travel... only $6 for a "bus", who could resist right? Better then over $100 for a taxi. Well the bus was a van, with as many Haitians and us crammed in best they could... and us with our giant backpacks propped up on our laps. They charged us extra cause we took up more room then Haitians ROFL. About halfway to Jacmel, we all had to get out of the "bus" and run up the hill, into the bushes past the military onto another "bus" further up the highway. Apparently an accident with a semi was blocking the highway, and no one was allowed past. We had no idea what was going on, and my friend thought we were all being robbed or something. We made it to Jacmel just fine though, and were greated by a plethera of motorcycle taxis. Now those are FUN! There were even a couple of them who knew where the hotel was! We managed to meet D the same day we arrived by saying his name to a couple of different people, and he was called over. Fortunately after about 5 minutes of my friend with his not knowing French that well and D not knowing French all that well, D called over someone to translate for all of us, in English. So we made the arrangements. Fortunately later he called over F who was an even better translator and even does Vodou. I wasn't as comfortable with the first guy since I could tell he didn't do Vodou, and that is what we were discussing. We planned for a ceremony, a bit of other work, and D offered us his workshops. My friend and I discussed it, and he managed to get some money wired to us (I'll be paying this trip off for the next 6 months lol). Then we step out of the hotel room and meet 2 Hongouns who were sitting right outside the hotel room , then down the street yet another (I think B). I was starting to wonder if all Haitians were really strong magicians at this point, ALL these guys had a VERY strong "I definitely work magic and know what I'm doing" presence! I'm sure you know what I mean by this, you can just tell when someone is adept at what they do magic wise. You meet the odd one over time, but not usually 4 in one day! We were definitely impressed enough to be looking forward to the ceremony and worshop. The ceremony was run extremely well, and went very smoothly. The folks there definitely knew how to get a strong spiritual feel and Lwa presence. The singing and dancing were done so well. Everything went very smoothly as well. I also have to say that the rootswithoutend folks are very good cooks. The sacrifice was cooked up, and many people got to eat. The ceremony takes all day really... the drumming and calling the Lwa, the sacrifice, and cooking, the later dancing and singing some more, the eating, the calling the Lwa again, feeding the Lwa, and so on. Then one of the Lwa (I'm not telling who lol) showed up when we were all sitting around talking and singing, and asked for a cow! At least it was a good trade. So then another ceremony a few days later, just as elaborate (if not more so) then the first. For the workshop, D walked us through the pastures and local area and showed us many different herbs and trees, and told us how many of them could be used for magic or healing. Fortunately we were able to take photos so we could remember better. He also taught us the proper way to collect the plants. We were also lucky enough to learn a few recipes. We were also taught how to do a ceremony, the four directions and so on. Fortunately I practiced a lot in the hotel room, but still had to get reminders from time to time. We were taught wanga and pwen, we were taught some magic with herbs, we were taught how to make a bath, and so much more! D also took us over to the tailor's to have our ceremonial clothing made, which is so beutiful! (photos to come) He gave us most of the supplies we needed, and helped us shop for the other stuff. I'm still amazed at how much rum Vodouists go through! I was most amazed when I found out you don't wash your hands with water during certain parts of a ceremony but with rum! We also did a ceremony for La Serine on the beach, which included swimming. It was sooo hot out that day, and the water was so refreshing but still warm. It was wonderful. The lobster was pretty nice also :). D had so much patience with us, and would reexplain or repeat things as needed. He didn't even mind when we argued a couple of points (he didn't understand that in north america people create some medicines completely in labs not even starting with a natural plant). He also was very patient trying to teach me how to sing, which I apparently have no talent for whatsoever LOL. Some of the highlights were: the 3 foot tall morter and 6 foot tall pestles they used, D showing us a cocoa tree, then climbing up the cocoa tree to get me some raw cocoa lol, the calabas magic, the lamp magic, being whacked over the head with a live chicken, the La Serine ceremony, learning the songs, trying my best to dance... OK all of it. I'm sure I have forgotten so much, but I'll sum up. The magic worked well, the ceremonies were done extremely well, the teaching was done as proffessionally as any University professor I have seen, and everyone was wonderful to us. I have yet to meet the main USA contact but if she selects people that well, and teaches them that well, she must be pretty amazing as well. Actually anyone who could go to Haiti alone and live there that long, has got to be pretty special. Most can't get there for a week, let alone live there. The Lwa all said I would be rich, so now I wait and see :). It was freezing when I got back home; I was just getting used to Haiti.. and there was frost on the ground here.